2018 – What’s your next move? Mars is now getting his mojo back after his loooooong time of backwards motion (Mars doesn’t do backwards very well!). Mercury has left his last retrograde well behind and is speeding through the sky. Venus is gliding swanlike through the last degrees of her home zone of Libra. And that tricky eclipse season is finally over. So yes, things feel on the up and up, the path has smoothed out, the sun is shining, the birds are singing… what could go wrong?! 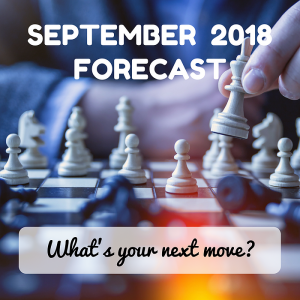 September sees Venus and Mars moving from dynamic cardinal signs into more staid fixed ones, and Mercury will change signs twice, so there could lots of chop and change after the inertia of the last few months. It’s just like a chess game, putting the pieces in place so you can take advantage of the opportunities that will open up as the year draws to a close. Keep a cool head and a close eye on the other player (which may just be the Universe), and you’ll be fine. One thing to highlight this month is Mars revisiting the end of Capricorn and early Aquarius for a third time. Look out for themes in your life since early May, anything that may have felt frustrating, anger inducing, blocking or even wanting to completely cut-off or withdraw. Now you have your second chance, revisit what was happening, squeeze the last bit of understanding from it and heal so you can move beyond. Have a look at all you’ve learned and make a course correction, slight or not, as there is much more clarity about your purpose and what is driving you. If there have been hurts along the way, forgiveness works magic, and Jupiter in Scorpio can help us find joy in the darkest of places. This energy lasts a while, and it starts off with Venus on her home ground in Libra and Mars feeling pretty uplifted in Capricorn so things seems easier as they’re both on their best behaviour. But when Venus moves into Scorpio the charm wears off and Mars into Aquarius the next day will see some containment and withdrawal. Competition in relationship may rear it’s head, causing you to assess your own value, what you feel you are worth and what you will NOT do. Causes of relationship conflict may need some more focus, especially if it’s conflict from mid-June still hanging over your head. It’s definitely a time to be honest and direct about your relationship needs, be willing to see from anothers perspective and to offer (and ask for) authenticity and freedom. Mercury has picked up some serious speed and is finally moving out of Leo, where he has been since the beginning of July (again, another planet that doesn’t do well with sitting still or going slow). Now he’s in his home ground of Virgo, he’s pulling on his analytical glasses to examine all he’s learnt about himself in Leo, and work out how we can best be of service to the world around us. Refinement of mind is the hallmark of the next few weeks, and you may find your thinking patterns go more internal as Mercury gets closer to the Sun. The image that springs to mind here is Kate Middleton in a burlesque bar: it isn’t really her kind of place and she won’t want media to see her there BUT she’ll probably make the most of it, pull out her charm and have some fun. Plus she’s got her friend Jupiter in there already, who’s bought her a drink, kept her seat warm and gathered a group of interesting people for her to meet. For us all it’s time to find pleasure and connection in the more intimate and vulnerable spaces. It can also bring healing and harmony to the pain that has been pulled into the light since Jupiter moved in there in October last year (#metoo). Happening at 4:03am AEST, this New Moon will be focussed on creating a stable base of efficiency, discipline, order and refinement so we can perfect ourselves towards a higher purpose. Part of this is around a good routine and looking after our body and health – cleaning up our temple. It also rules our day-to-day work life and projects, as well as building a good service life that is focussed on helping others. More on this to come closer to the time. We’re back in the territory Mars entered last on 17 May, with a focus on living our ideals and following our passion towards our higher purpose. Clarity and insight abound now, as progress picks up and we can finally move forward on whatever plans or projects have been put on hold since May. Being an air sign, listening to your rational mind and staying neutral will pay dividends in whatever path you decide to follow. It’s all big picture stuff, and the trials and tribulations of the last few months have given us all some new perspectives. Don’t be afraid to make the changes that are needed to let this fresh breeze blow away the cobwebs. 11 – 12 September – Mars, Venus – meet Uranus! Oh, and hello Ms Moon in Scorpio! With Mars back into contained Aquarius, and Venus in the depths of Scorpio, both will come into contact with firecracker Uranus who is grinding his way through earthy Taurus. And just to add to the fun, the intensely emotional Moon in Scorpio will join the party. It’s like having dinner with family who don’t get along and you’re just waiting for something to explode. Fireworks are likely, and with our emotions in the driver seat we’re liable to be driving blind. There may be sudden urges to rush into something when it comes to partnership… just heed the old saying “Love in haste, repent at leisure” and you could also insert the word “hate” instead of love here too. Be conscious of impulsive spending on pleasurable things to try to feel better – self-worth was never found in the bottom of a shopping bag. Luckily Mars will meet up with fixed star Altair at the same time, and bring some of his high-minded wisdom into action. And remember while honesty is vital, it doesn’t need to be brutal! · using your deep emotions or intuition to create something beautiful and unique… an art therapy workshop perhaps or just letting the creative juices flow without judgement. · surprising your loved one with a romantic adventure where you have space for just yourselves. Or astrologer speak for a day of brilliant communication! When Mercury is right up close to the Sun (within 17 minutes), it gives an extra boost of energy to any Mercurial tasks. Think communication of any kind, so it’s a great day for writing, connecting with others, teaching or presenting, short trips, even organising or planning under this Virgo energy. Mercury will be cazimi the Sun between 3:51am and 7:51pm AEST that day, so make the most of it by holding any important conversations, signing contracts or making a proposals under it’s benefical and persuasive energies. *A short note from Alicia: Mars is pretty strong in my chart (an understatement, but that’s for another time), and now it’s finally going direct I’m being dragged forwards, whether I like it or not, with things I promised myself to before the retrograde happened. Let’s just say this Mars retrograde has been full of revelations for me around what I say yes to, how I prioritise my time and my time management skills. So my apologies that this forecast is late and not in video. It’s also cut short because later in the month I’m moving to monthly forecasts that will follow the Sun changing signs. I believe this will offer a better and more consistent main backdrop to the month. It feels right to plan this with the Sun in Virgo bringing focus on the practical doing of things, looking at the purpose of our lives and becoming our best possible selves. On 23rd the next forecast will be released as the Sun moves into balanced, harmony seeking Libra. Until then, wishing you much success!